Alaskan Husky encephalopathy is an inherited neurological disease affecting Alaskan Huskies. Affected dogs are unable to produce a protein important in transporting the essential nutrient, thiamine (vitamin B1) into cells of the body and typically present with neurological symptoms between 6 months and 2 years of age. Cells of the nervous system are particularly dependent upon thiamine for the nutrient’s role in energy metabolism. As seen in this disorder, severe thiamine deficiency leads to death of neurons in the brain and subsequent neurological disease. Symptoms include weakness in limbs, altered mental state, loss of balance, abnormal gait, decreased facial pain sensitivity, difficulties eating or swallowing, seizures and blindness. The progression of disease is variable with some dogs going through periods of static disease progression, but most dogs die due to disease complications or humane euthanasia within several months of initial clinical presentation. Genetic testing of the SLC19A3 gene in Alaskan Huskies will reliably determine whether a dog is a genetic Carrier of Alaskan Husky encephalopathy. 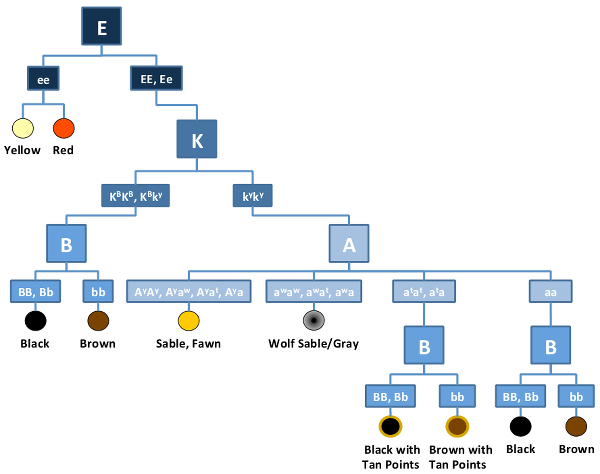 Alaskan Husky encephalopathy is inherited in an Autosomal Recessive manner in dogs meaning that they must receive two copies of the mutated gene (one from each parent) to develop the disease. In general, carrier dogs do not have features of the disease but when bred with another carrier of the same Mutation, there is a risk of having affected pups. Each pup that is born to this pairing has a 25% chance of inheriting the disease and a 50% chance of inheriting one copy and being a carrier of the SLC19A3 gene mutation. Reliable genetic testing is important for determining breeding practices. In order to eliminate this mutation from breeding lines and to avoid the potential of producing affected pups, breeding of known carriers to each other is not recommended. Alaskan Huskies that are not carriers of the mutation have no increased risk of having affected pups.